Rub the margarine into the flour until you have bread crumbs. Add the 125g Carnation Evaporated Milk and mix through with a fork. Use your hands to bring the dough together to form a ball. Wrap in cling film and put in the fridge to rest for at least 30 minutes. Place 3 skinless chicken breasts into a saucepan and cover with water. Bring to a slow simmer for 30 minutes, remove from the water. Allow to cool slightly and then shred the chicken. Heat the oil in a large non-stick frying pan. Add the diced onions and fry on a medium heat until glassy. Add the shredded chicken and the drained sweetcorn. Sprinkle over the flour and mix through, then pour over the Carnation Evaporated Milk before adding the stock pot. Bring to a simmer until thickened. Sprinkle over the chopped parsley and chill the filling in the fridge. Preheat the oven to 200C (180C with fan) Gas mark 6. Grease a muffin tray. Take the pastry from the fridge and roll on a floured board to half a centimetre thick. Cut into 12 circles to line the muffin cases, and 12 smaller circles to top the pies. 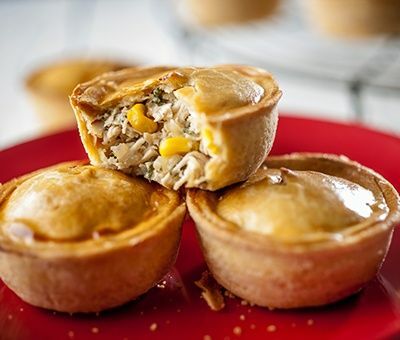 Fill the pies with the chilled mix and top the pies with the pastry discs. Press the edges to seal and then brush with egg yolk. Place in the oven and bake for 20 minutes till golden brown. For an easy short use ready rolled short crust pastry and skip Step 1.